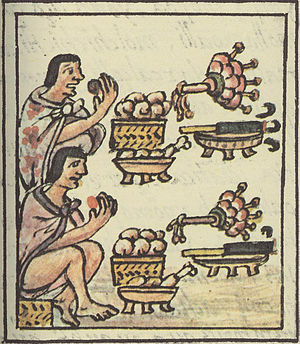 ↑ The full list of cacao flavorers is very extensive, but some of the common ones were uei nacaztli (Cymbopetalum penduliflorum); teonacaztli (Chiranthodendron pentadactylon), which had the flavor of "black pepper with a resinous bitterness" and was commonly used at banquets; mecaxochitl (Piper amalgo), a relation of black pepper; yolloxochitl (the flower of Magnolia mexicana) which had the taste of ripe melon; piztle (the seeds of Calocarpum mammosum), with the flavor of bitter almonds; pochotl (the seeds of Ceipa spp. ), described as "sweet and tasty"; and allspice. 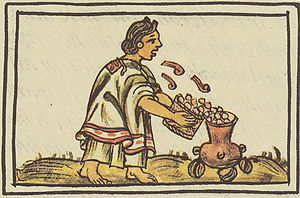 One of the most common recipes consisted of mecaxochitl, uei nacaztli, vanilla, softened maize and cacao mixed with tepid water, and was drunk immediately after preparation.